Want to work with adult neural cells in vitro? Whether you work with astrocytes, neurons, oligodendrocytes, microglia or endothelial cells, it has never been easier! Discover our adult brain workflow! Join Hui Zhang, PhD, and her webinar on the latest options and integrated solutions for neuroscience research and the use of MACS Technology for adult brain dissociation and neural cell isolation. 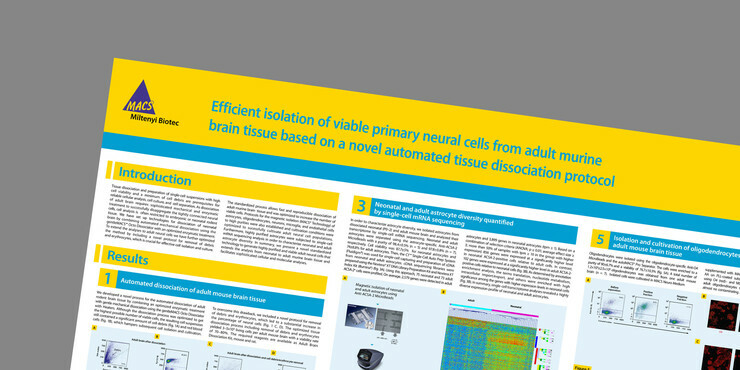 Download our poster on isolation of primary neural cells from adult murine brain tissue. Do you want to see more data?